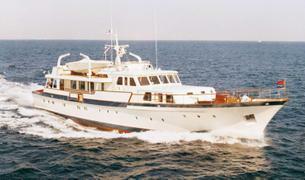 The 32 metre classic motor yacht Arcadia, listed for sale by 26 North Yachts in Fort Lauderdale, has been sold in an in-house deal. Built in steel and aluminium by Dutch yard Feadship to a design by De Voogt, Arcadia (ex-Prosit) was delivered in 1969 and is currently completing a massive $14 million refit. Her interior, in book matched teak, accommodates up to six guests in three cabins comprising a master suite, VIP suite and a twin, all with en suite bathroom facilities. An additional two cabins sleep four crewmembers. Among the features requested by her original owner were a fishing cockpit complete with stainless steel fish and bait boxes, with their own running water, and two customised fishing chairs. The main saloon and dining area are open plan and have a teak interior in excellent condition with a lovely rich colour. With a beam of 7.62 metres, she has a spacious living area and a recessed flatscreen television on the starboard side, which allows for relaxed viewing. Most of the furniture here is loose and was replaced during the refit, when the overheads were also redone and new recessed lighting has been installed. Twin 660hp Caterpillar diesel engines give her a range of 2,400 nautical miles at 12 knots and she is fitted with Naiad zero speed stabilisers.